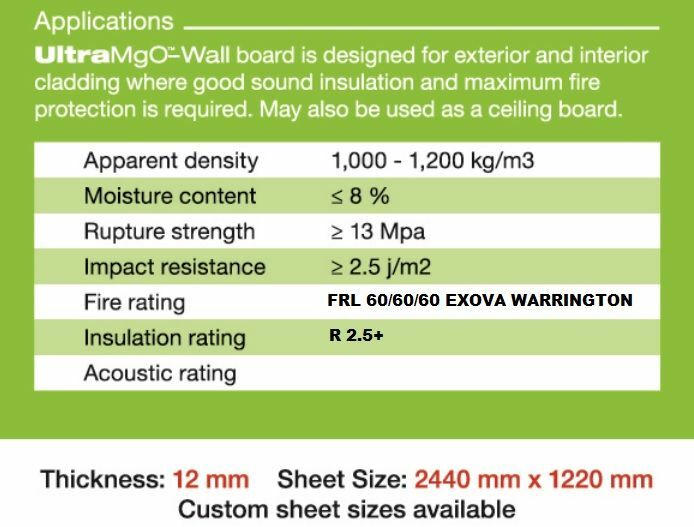 Ultra MgO 12 Wall board is designed for exterior and interior cladding where good sound insulation and maximum fire protection is required. It may also be used as a ceiling board. Ultra MgO 12 Wall board is a light weight building board with many uses and applications in both residential and commercial builds. The simplicity of application make using Ultra MgO 12 wall board time efficient and simple to install with minimal wastage or breakage commonly experienced with regular plasterboard and other inferior building boards. One of the key features of the Ultra MgO range is that they have all been tested on pine timber frames as is part of the normal building practice.